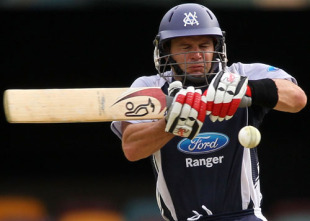 Brad Hodge produced a belligerent century and Shane Harwood delivered a stinging performance as Victoria demolished Western Australia at the WACA. Hodge smashed 134 off 125 balls to rush the visitors to 4 for 319 before the Warriors fell for 206 to suffer a 113-run defeat in their first match under Mickey Arthur, the former South Africa coach. In between the two stages of Hodge's brutal innings, Harwood ruined the home side's top order with four wickets on the way to a career-best 6 for 46 off 7.4 overs. The performance was particularly satisfying for Harwood, 36, as he was returning from major shoulder surgery that threatened his career. There were no problems over his pace or bounce as his sharp lifting deliveries ended the stays of Wes Robinson (2), Shaun Marsh (18), Liam Davis (33) and Adam Voges (32). The brutal five-over spell left the hosts at 4 for 88, 53 runs behind their opponents after 20 overs, and the game was almost over. Hodge, who resumed on 58, and Aaron Finch, who was 54, quickly made sure of the result as they took advantage of Western Australia's wayward bowling. Finch fell for 81 off 75 balls - he peaked with three fours from a Brett Dorey over - but Hodge kept going and showed that he remains a master at the age of 35. In his first innings he hit the debutant Michael Beer for a straight six before slog-sweeping another next over from Aaron Heal. His century came with a glide to third man - he celebrated with a couple of push-ups - and after crunching Ashley Noffke (0 for 82) for fours through cover and midwicket, he then showed more muscle by clearing the sightscreen in the final over of the innings. Andrew McDonald also beat the rope twice in his unbeaten 30 off 20 balls. Western Australia required an almost impossible 232 from the final 25 overs, but Luke Pomersbach and Luke Ronchi gave it a go during a 46-run stand off 31 balls. However, Ronchi fell on 28 to a miscue to midwicket and next ball John Hastings (3 for 50) had his second when Pomersbach (16) found mid-off. Mitchell Marsh showed flashes of brilliance in his 44, including hitting Harwood for six to long-on, but he gave him his fifth wicket aiming another big shot. Next ball Harwood picked up his sixth, ending the match with the lbw of Beer. Peter Siddle played his first game in Australia after over-coming back stress fractures and showed decent pace in his 0 for 53 off nine overs.